The following information is for private citizens only NOT home health care agencies, commercial, or veterinary use (including syringes used for animals). These providers are required to dispose of medical waste according to the New Mexico Administrative Code. Albuquerque Fire Rescue does not dispose of medications or infectious waste that has not originated from Albuquerque Fire Rescue stock during the course of patient care. Members of Albuquerque Fire Rescue will refrain from taking possession of medications and infectious waste from the public or private entities. Call 311 to report it and someone will be dispatched to pick it up although response times may vary depending on who is available at the time. 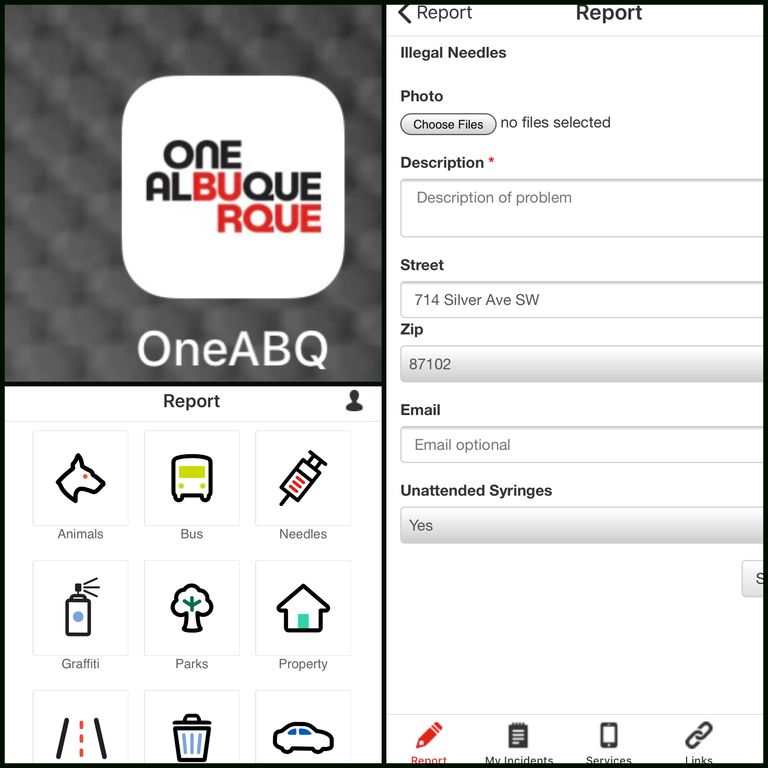 Use the OneABQ App on any smartphone or device and report it by selecting the "Needles" icon and filling out the information requested for the incident. The report will be emailed to the appropriate resource and someone will be dispatched to pick it up although response times may vary depending on who is available at the time. Pill Medications and needle sharps are acceptable for disposal at the locations listed below. These can include doctor prescribed and over-the-counter medicines, vitamins, herbal supplements, and pet medications. Remove all medications from their original containers including pills in foil and place them in a sealed bag for disposal. Put all household generated sharps (needles, lancets, and single razor blades) into a rigid plastic container such as an empty laundry detergent or bleach bottle. Prescriptions on the Environmental Protection Agency's P or U list. If unsure about the medication, call the APD Evidence Division at (505) 823-4200. These collection boxes are for household, human sharps only (syringes which are used for human injections), NOT for veterinary clinics , medical practices, nursing homes, tattoo shops, acupuncture clinics, non-NMDOH Harm Reduction affiliated community organizations, etc.